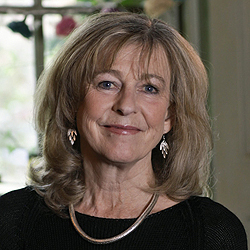 Following a successful career as a novelist Deborah began writing screenplays in the mid-eighties. She wrote a thriller about the movie business called The Stand In, which she scripted as a Hollywood movie, and adapted Pride And Prejudice as a film starring Keira Knightley, for which she received a BAFTA nomination. She also adapted Nancy Mitford’s Love In A Cold Climate for the BBC and won a Writers Guild Award for her adaptation of Anne Fine’s Goggle-eyes. The most recent of her own novels to be adapted is Final Demand, starring Tamsin Outhwaite – a story of fraud, retribution and reptile-breeding. These Foolish Things, Deborah’s novel about outsourcing elderly Brits to India, was released in 2012 as The Best Exotic Marigold Hotel and became quite a hit and spawned an equally successful sequel The Second Best Exotic Marigold Hotel in 2015. This is the 7th year I’ve been to LSF and it keeps getting better!